Alesis Q25: small but playable? 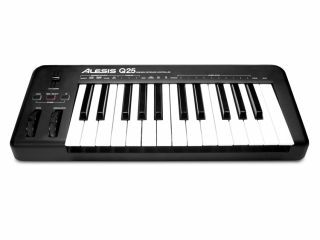 Alesis is throwing its hat into the ultra-compact MIDI controller keyboard ring with the announcement of the Q25. This comes hard on the heels of the launch of Korg's microKey, though the Q25 differs in a couple of significant respects. It has 25 keys as opposed to 37, but the better news is that these are of the full-size rather than mini variety. Significantly, though, the Q25 is still pretty compact, checking in at 19 inches wide, 7.25 inches deep and 2.38 inches high. It's also worth mentioning that you get proper pitch/modulation wheels rather than buttons, plus octave up/down buttons and an assignable data slider. From having limited options in the mini MIDI keyboard market, there are now plenty to choose from, with Akai's LPK25 also being a contender. The Alesis Q25 will cost £60, though we're not yet sure when it'll be available.